Your RV is your beloved home as you explore the open road. Along your journey, the rigors of the road and the tolls they take on your RV necessitate you to make pit stops for RV repair. 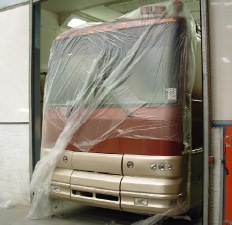 When you hand the keys over to an RV service centre you naturally expect devotion to detailed care. From RV parts and accessories to RV repair and service, the expert craftsmen at Mercury RV are passionate about ensuring your home on wheels is afforded the best possible care. More than mechanics, the Mercury team consists of a highly specialized workforce dedicated to their profession. With our service centre, a passionate team of technicians, and a huge stock of RV parts, Mercury is miles ahead for RV repair. Whether your RV needs small tweaks under the bonnet or a complete cosmetic overhaul, our team of specialists is more than equipped to handle any and every bump in the road. At Mercury RV we vow to wholly commit ourselves to solving any problem your RV may have so that you can return to the open road and continue your journey and adventure with confidence. No matter where you are, we're always close by and ready to help you with your RV service or repair needs. If you have a need for body and paintwork, there is a 50 foot downdraught oven just waiting for you! ... and we have a trimmer that can offer bespoke upholstery and tailoring to re-furbish your interior seating etc. One of the services we are finding customers are keen to exploit is the refurbishment of a range of top grade older RV's we import. In essence this means we import a high end unit that would have sold for in excess of around $270,000 in 1995/6/7, we then, to your order, work with you to find a design for the interior and exterior using modern fabrics or leather and paint designs, this is then used on the unit to produce something that has a stunning appearance, however at a fraction of the price of what it may appear. The best of everything including your ideas then results in a unit that perhaps you had only dreamed of. This may not be for everyone as it needs foresight and input from you, however we can show you many ideas and will always be ready with suggestions for you to consider. In effect, the end result is a near new unit with all the best the RV world has to offer, but created for you exclusively! By bringing unique services to our customers, we are able to differentiate ourselves from the competition. We try to make it as simple as possible for you to work with us. By developing a strong relationship, we hope that you will contact us for all your RV needs. Just use the email or telephone contact points and we will do our best to assist you. These before and after pictures, show a customer's Motorhome that came to us looking a little tired, however we carried out a full mechanical overhaul on it for him plus a makeover on the body. When finished the whole Motorhome really gleamed better than it did when it was new, and with a fresh MoT, he was on his way for some happy and worry-free travels.